At the farms Professor Fraser visited, dry cows lived on irrigated pasture. This September, Professor Evan Fraser joined scholars, writers, performers, scientists, artists, and business leaders in St. John’s, Newfoundland for the Walrus Talks H2O, to deliver his insights on agricultural water supplies . If you will, please imagine standing in a large parking lot, on a hot summer day, with the sun beating down at approximately 40°. The location of the scene is somewhere in the US Midwest, the time was a few years ago, and the occasions was an undergraduate agricultural field trip that I was accompanying with students from the University of Guelph. It was dry – bone dry – and on one side of the parking lot were three huge open topped storage facilities filled with grain – each were hundreds of meters long and dozens of meters wide and probably five meters deep. Now you have to imagine a front-end loader – a digger – towering over you but as it drives away into these storage cavities it gets smaller and smaller being dwarfed the volume of the storage bin. On the other side of the parking lot are large enclosures where approximately 2000 black and white dairy cows eat the grain from these bins. Surrounding the farm are thousands of hectares of irrigated pasture’s where another 2000 cows, those that are not lactating, graze happily on lush fields. Surrounding this are non-irrigated or natural fields that are dry and scrubby supporting only a small number of individual beef cows. At the centre of the farm is the milking parlour where every 12 minutes, 23 hours a day, a dozen cows are led. This is a scene that’s typical of dairy across the US, and while in Canada the dairy farms remain only 1/10th the size of what I’ve just described, they too are growing in scale. What you have to realize is that this kind of intensive dairy production is thirsty business. Indeed, this is one of the most water demanding forms of agriculture in history. This translates into 60,000 L of milk being produced on this one dairy each and every day. When you add the water these animals require simply to survive in the hot conditions, along with the water required to grow the grain they are fed on, then you need a minimum of 240,000 L of water each and every day this one dairy farm. As it happens, this particular farm was also in a semi-arid part of the American Midwest and we were visiting during a drought. This answer was delivered authoritatively and the student seemed satisfied. But as we were leaving the farm the student started talking about this again and very quickly did a little bit of web research. What they came up with was fascinating. I’ve now like you to imagine that you’re on a satellite hundred miles above the American Midwest looking down at North America. The Rockies are on the left and the Mississippi is on the right and in between is a gradient of grey browns and greens as the arid conditions in the rain shadow of the mountains give way to the moister basin in the Mississippi. I’d now like you to imagine that not only are you in a satellite but you also have x-ray vision and are able to peer beneath the Earth’s surface down down down into the water table. Doing this you discover that underlying much of this area is a vast underground reservoir of water, most of which was left to us by the glaciers when they retreated 10,000 years ago. This aquifer, which is called the Ogallala, is the lifeblood of North America’s food system. The area in which the farm I just described sits, has, according to the US geological survey lost over 100 feet of depth in the past few decades and the most recent assessment that I have read suggests that over 30% of this area will not be able to sustain irrigation beyond the next generation. So we have, in the conflict between the farmer’s perception of abundance and the realities of a dwindling resource. What is going on in the American Midwest is actually being repeated around the world. One of the recurring themes in the 21st-century is that we are running out. Nevertheless, we persist with an illusion of abundance. The core question remains, however, what can we do about this? Broadly speaking, there are three technological strategies we can take. The first has to do with plant genetics. Around the world, plant breeders and geneticists are working to create more drought tolerant varieties of the crops we depend on. In particular, many scientists are trying to take advantage of the fact that a few plants (only about 20% of all species) are what are called “carbon-4” or “C4” photo synthesizers since they have an extra carbon molecule in the chloroplast that allows them to continue producing sugar even under very hot and dry conditions. Most plants, however, including wheat and rice, do not have this extra carbon molecule and so become stressed much sooner when the moisture is low. Work is underway to breed crops that have this extra carbon molecule and this would make them much less vulnerable. But while such genetic approaches show promise, many consumers are skeptical and a second approach is being explored that will allow farmers to be much more efficient with water supplies. 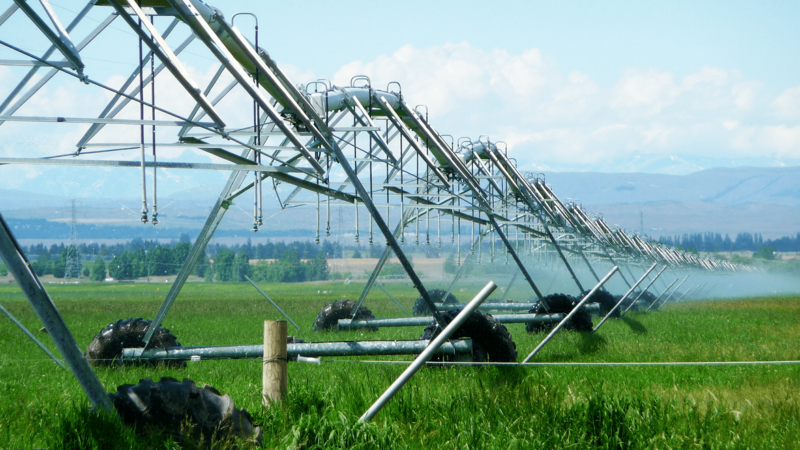 In the future, “smart” irrigation systems will be linked to detailed soil maps and satellites in order to ensure that the right amount of water is delivered to each plant when it needs it. Such technologies generally go under the heading of “precision agriculture” and represent the marriage of soil sensors, moisture probes, and big data analytics. Again, such a “high-technology” approaches show promise but may leave many skeptical and so a third broad strategy farmers can adopt to reduce their vulnerability to drought is broadly termed “Agro-ecology”. Agro-ecological farmers would use mixtures of crops and lots of manure to help build up soil organic matter, which is important because soil organic matter acts like a sponge trapping water when it is abundant and storing it for when it is needed. Between these three approached (and my own feeling is that all will be necessary depending on where in the world you are), we can create a global agri-food system that requires much less water, is more productive under low water conditions, and is able to keep producing even as the weather becomes uncertain. But my final message is that this will only be possible if we get the policy signals right. In other words, and returning to the dairy in the US mid west, we need to make sure that policymakers and resource users are not working under the illusion that water is plentiful when in fact it is becoming scarce.